Although Google has born the brunt of much criticism concerning the reach (or lack thereof) of its latest and greatest mobile OS, the grand Ice Cream Sandwich rollout is in full flow, and the next in line, it would seem, is Samsung’s larger-than-life ‘phablet’, known to its mother as the Galaxy Note. The i717 ROM for the AT&T Galaxy Note has just entered the wild via RootzWiki, and although Samsung has already revealed a Q2 release bracket, it seems consumers aren’t going to have to wait until early summer for their complimentary (and let’s face it, long overdue) Ice Cream Sandwich. According to different sources, the Release Candidate version – almost final – is being tested internally as we speak, suggesting a public, OTA release to the end-user is no more than a couple of weeks away. The ever-popular Galaxy S II was one of the first to enjoy a taste of Android 4.0 after the Galaxy Nexus, and not much is different in the Note version when compared to that of the S II. The mongrel of the mobile device spectrum has managed quite a significant amount of success – despite dividing the opinion among consumers. While not everybody is sold by the colossal 5-inch screen, its marketing angle as a great ambassador of the creative mind has seen many consumers give it a whirl – rendering it one of the more successful Android stories. If you fancy manually flashing the update, we’ve got the tutorial for you. Before we get started, please note that the Premium Suite is not included in this build. The TouchWiz launcher crashes on first boot (but not on subsequent boots), and also, when you add a Google Play account. Additionally, the build will increase your flash counter. Also, this guide is only for Windows users – there’s no current Mac support. Step 1: Download Odin One-Click from here. Step 2: Reboot your Samsung Galaxy Note in Download Mode (Hold Power , Volume Down, then Volume Up). Step 3: Connect your device to your computer via USB. Step 4: Run the Odin One-Click file in order to get your device updating. It should detect your device as com3 (in yellow). Step 5: Click the PDA button and select your ICS ROM [Download link]. Click Start. Step 6: How easy was that? 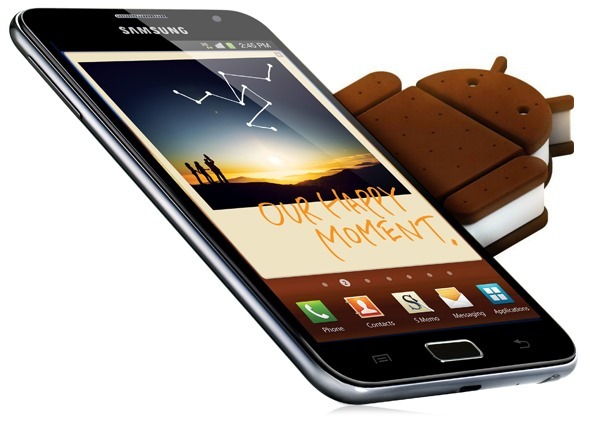 You’re now free to enjoy Ice Cream Sandwich on your AT&T Galaxy Note! Once AT&T has finished testing and tinkering, the official update can begin. We will notify you once this occurs, but in the meantime keep checking for update notifications. If some of you folks is not able wanting to ՍΝᏞΟᏟΚing AT&T devices, you can have a look at just google atttiphoneuunloockiing, it’s one of many few sites that is still able to սոⅼοсking AT&T phones after AT&T had its database renewed, which means AT&T does’t encourage the access with their database for most cheap ՍΝᏞΟᏟΚings.